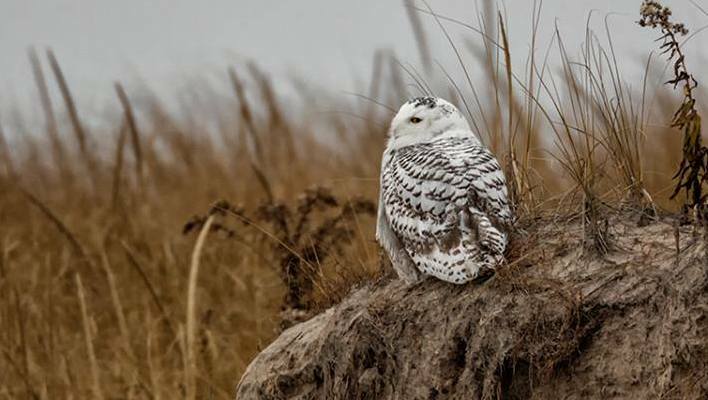 The Snowy Owl invasion of 2013-14 is remarkable for a number of reasons. Not only was it the largest influx of the species into the eastern United States and Atlantic Canada in memory, with individuals showing up as far south as Florida and Mississippi, but it was the first time ever that birder have been able to follow the movements of individual owls as they do what owls do. Jennie Duberstein introduced Project SNOWstorm a couple months ago, but if you haven’t been following along now you absolutely should be. The researchers have put transmitters on 15 owls in 6 states, and those owls have provided some incredible maps illustrating just what they do when they makes these huge, and still mostly mysterious, irruptions into the south. Some of them have mostly stayed put, happy to hunt in fields no more than a few hundred meters from the place they were trapped and tagged. Some, though, wander extensively, crossing wide bodies of water on a regular basis apparently in search of rafts of roosting waterfowl. One of the most incredible owls is one dubbed “Erie”, who spends weeks at a time wandering back and forth across the lake which gave it its name seeking out polynyas, great ever-changing cracks in the ice where ducks congregate. His map shows him wandering between the US and Canada as the ice shifts. A lot of this behavior is stuff we’ve never had confirmed before. It seems that many of these owls are in good health, and already adept at hunting waterfowl and rodents in places that seem quite different from the Arctic tundra with which we commonly associate them. And as the winter wears on, we may get some insight as to where these birds were coming from and where they’ll be heading back to. This project is so much more than just tracking these owls down here, and there’s so much to learn about them. It’s all very exciting. You can follow along with the continuing research at Project SNOWstorm’s website. And of course, donate to the cause if you so choose.